Week 1 of Project Life is done and in the book. I think that means I’ve officially scrapped more of 2012 than I did all of 2011. I absolutely loved all of it: the process of taking notes and photos during the week, putting it together in the album and especially the finished product. I love that I have a solid overview of what we did that week, and I love that it encouraged me to take a lot more pictures and be more present than I have been lately. 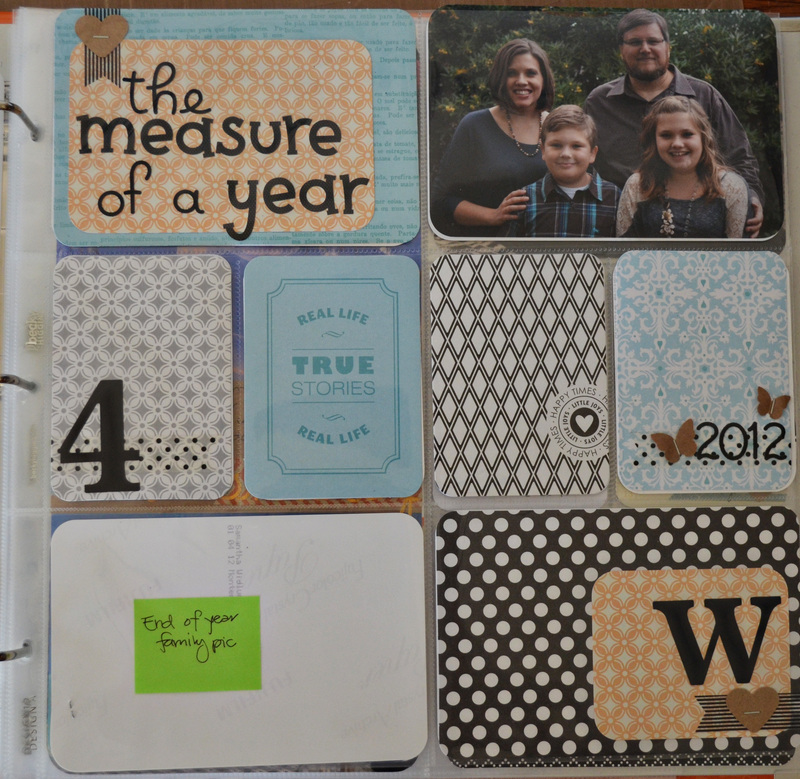 the cover page…still hoping to use lyrics from Seasons of Love throughout the album when I have an empty space. page 1 – it’s a total mish mash style-wise and I kind of love that. page 2 – my plan for Project Life has been to just get it done – no over thinking – and sometimes that is just plain hard. I wasn’t happy with the pictures I had to work with (solved by ordering a new camera – the difference this week in incredible) and I feel like I’m still learning how to get the best use out of the spaces. But it’s done and I’m moving on to week 2. 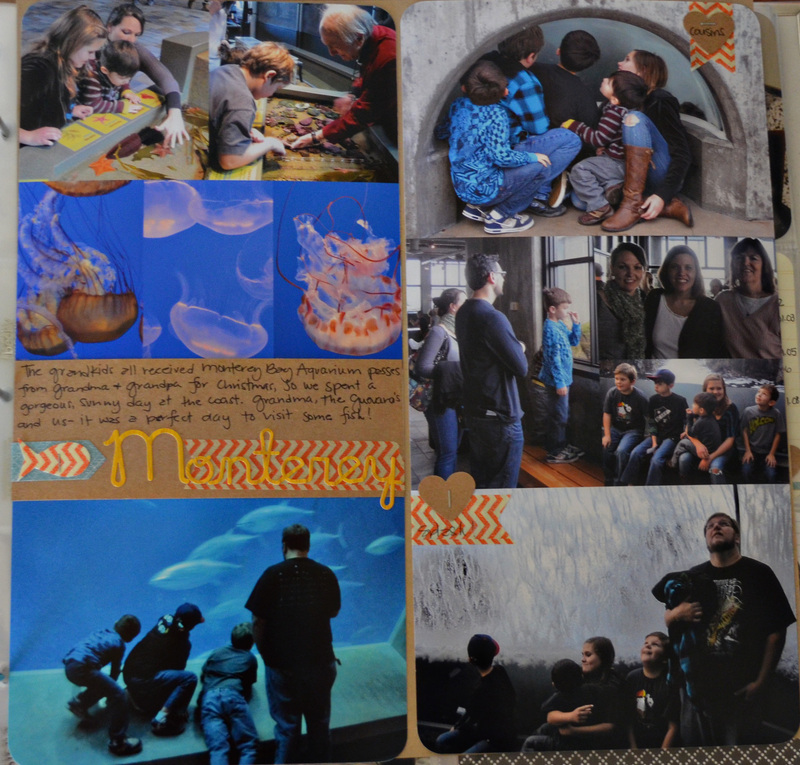 6×12 insert – I knew with our visit to the Monterey Bay Aquarium, I’d end up with an insert this week. I have a serious issue when it comes to taking pictures of jellyfish. I put together 2 6×12 canvases, left a little space on the one for journaling, put them together as a 12×12 and had them printed. I can see myself using this quite a bit – for trips, special days, holidays that sort of stuff. I’ll definitely be including a little day-by-day card each week. It worked out really well to include the other stuff – the things that didn’t have pictures or weren’t necessarily all that exciting, but that make up part of our every day lives. 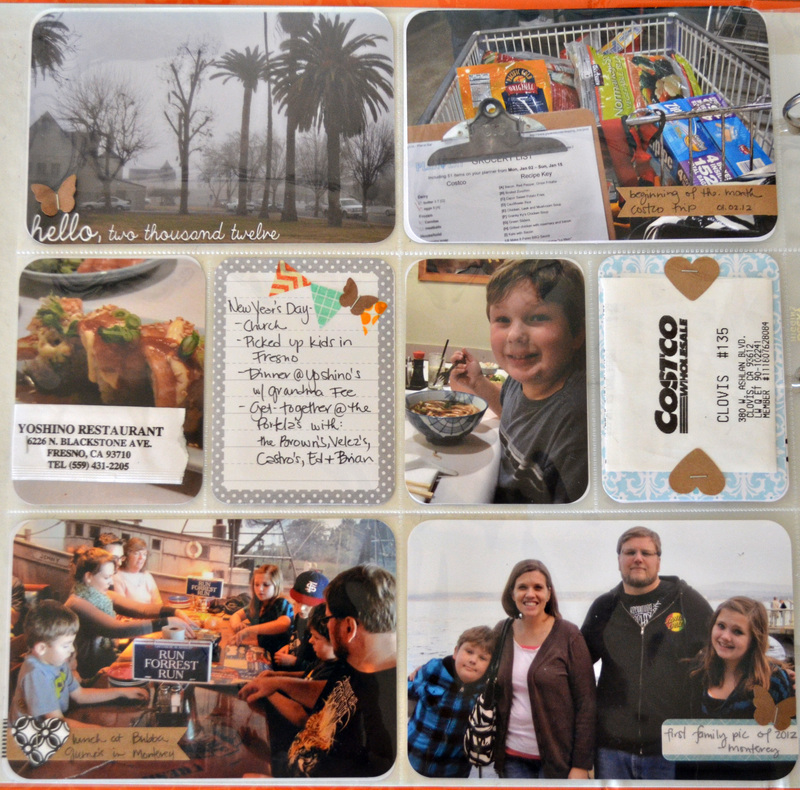 I want to work on more ways to incorporate other stuff – photos, packaging, the kid’s school work. 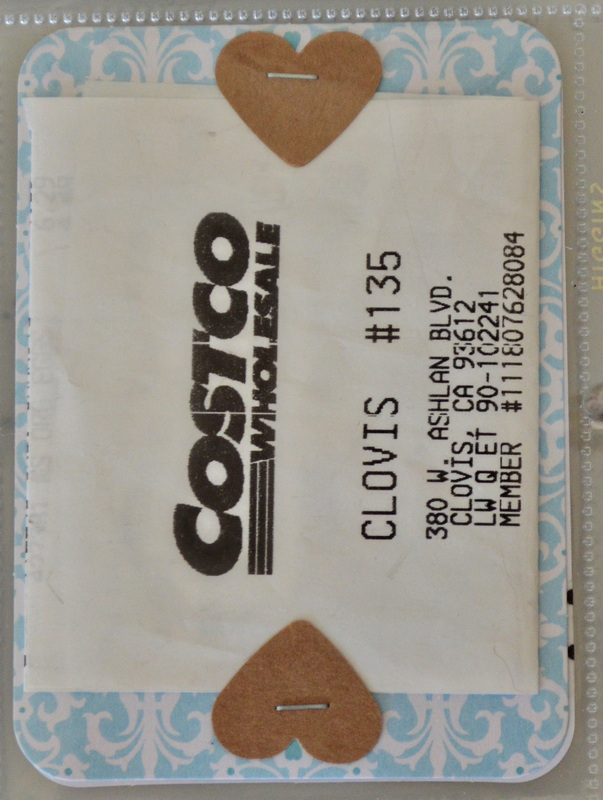 I was happy to get in our beginning of the month Costco receipt, and was proud I thought to grab a chopsticks wrapper from our New Year’s Day sushi. 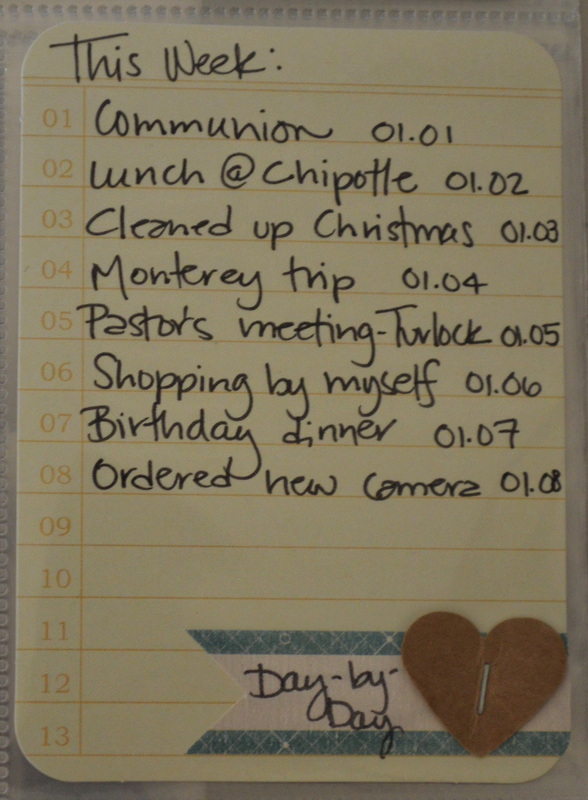 I’ve decided this album is a process, and I’m totally okay with it if the last week looks nothing like the first week. I’m not sure I love the rounded corners…I’m going to start doing a little journaling on some of the photos before printing…and I’m sure there will be other changes as it evolves. It’s good. I’m struggling between my need to journal everything and the size constraints. I don’t want to go any bigger than a 2 page spread per week (with an insert for special things), and I don’t want to feel like I’m skimping on photos. I’ll figure it out eventually. I’m jotting notes on Evernote each day and trying to pull photos off the camera at least twice a week, but deciding which stories are the most important…I think about it a lot. I’m trying to learn to say no to some things, knowing that it’s something we do all the time and I can use it later on when our weeks are quieter. I’m using Marcy Penner’s page planner Week 2 to see if it helps when it comes time to sit down and put the week together. So far, I’m liking it – just having a general framework seems like a good thing. How much do I love the divided page protectors? So much that I’m planning to reevaluate a few big trip albums I have in progress so I can finish them off this way. And enough that I’ve already decided our possible trip to Yellowstone this summer will be scrapped using these page protectors. I’m also considering ordering either a whole bunch more of the Design A page protectors (or maybe some of the Doodlebug ones) and doing a one month spread for 2010 and 2011. Those two years are seriously un-scrapped. 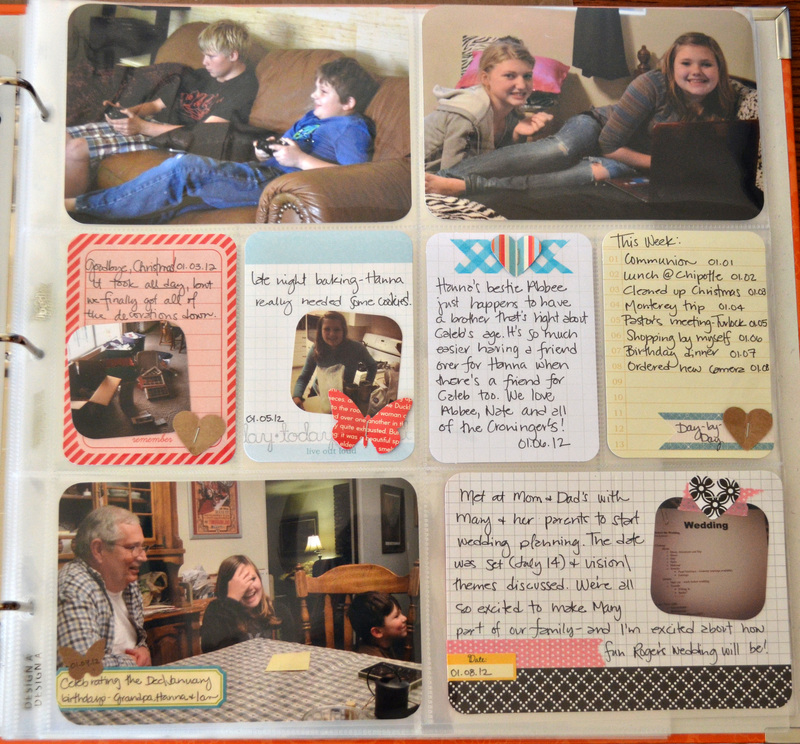 This entry was posted in Project Life and tagged family scrapbook, Project Life, scrapbooking by Awkward Girl Gets Fit. Bookmark the permalink.